Picture yourself in a boat on a river, with tangerine trees and marmalade skies… and you’ve got a basic grasp on what the mood is for Spring/Summer 2015. It’s all Woodstock and dreamy and Instagram tinged. There’s nothing debauched or wild about the summer of 2015, it’ll all be free love and soda pop. How refreshing! In saying that I ignore the lesser trend of futuristic, minimalist athlete (Apple Watches don’t really go with the boho vibe), but overall you’re going to be channeling a carefree flower child… with a touch of the Margot Tenenbaums. A little 21st century sullen grouchiness offsets the 70s feel beautifully, don’t you know. Most of us don’t have the appropriate budget to fully embrace a fashion season, but luckily for us mere peasants there are plenty of key pieces to complete this season’s story. Don’t be scared, but yes, the flare is well and truly back. 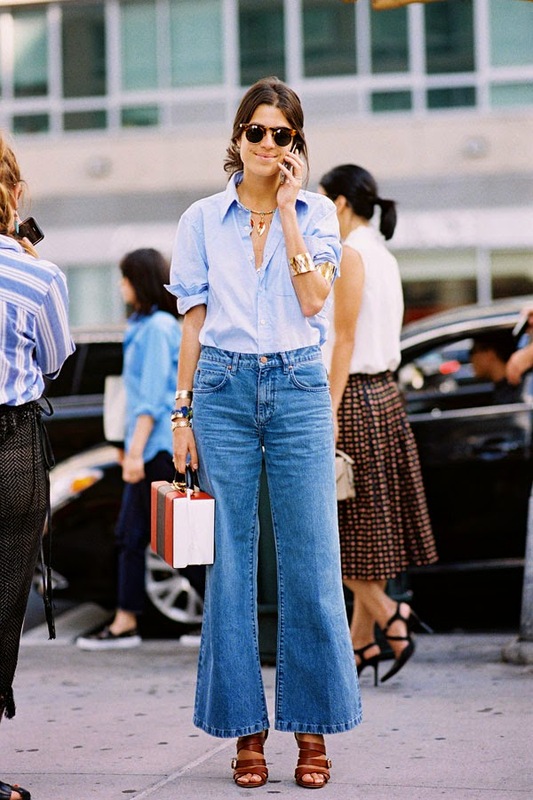 Jeans are probably the safest bet; team them with a that denim shirt you no doubt wore just yesterday and you’re absolutely good to go, but make like Olivia Palermo and venture into beige if you dare. I love this silhouette, and it’s perfect for balancing out wide shoulders or hips- much more flattering in those instances than the beloved skinny. It’s easy to use super tall and thin uber model Karlie Kloss as an example in flare-wear, but come on, what a cute look! Simple as anything, the chic striped top and mono bag are lovely foils to the more utilitarian denim and again, are items that you more than likely already have close to hand. The cropped flare is legit way, way scarier than the bell-bottom and culotte combined, but it’s cropping up (seewhatididthere?) on fashion plates all over the shop and just won’t go away. Not for the faint hearted, definitely for the most dedicated follower of fashion – Leandra Medine (above) doesn’t call herself the Man Repeller for nothin’. This was seen in abundance in New York this month, unsurprisingly given its all- American pegdigree. And why look, it’s Olivia again! Some might say I have a little girl crush on her (who can resist that lovely hair goddamit?!). But see how she works fringing without coming across all cowgirl? The average laydee would be better off sticking to either skirt or bag, and the more reasonable would just choose bag – but see how swish! Make like the Tommy Hilfigger fake bride (top pic) and wear white lace minis all summer long, see if I care. White was all over the Oscars red carpet, it was a staple for winter and it’s going nowhere fast this spring. And with good reason – it takes confidence to wear white (especially if you’re a drinker of red wine) so if you want to make an impact with minimal effort, a textured white dress with a few bangles and a long necklace or a scarf will do all the work for you. Mulberry knows that it’s 2015, and wants you to know that it knows, hence the self conscious meta photoshoot with Georgia May Jagger, but its inspiration is from a bygone day (that of Georgia’s ma Jerry Hall in fact) and that’s cool with us. There’s that big, textured hair and summer white that is so prevalent, but take extra special note of the incy little handbag! No self respecting fashion gal will be lugging around a tote with her whole life in it this summer; all you need is a sample-size lippy and a few lady products and you’re set (your phone, camera, kitchen sink will all be on your wrist of course). … and keep hair and makeup as natural as you would after rolling deliriously out of bed and realising you’re half an hour late for work. I’m not the hugest fan of this interpretation of sporty – though I am in favour of loose, relaxed pants as a rule, albeit in a more put-together fashion that isn’t concurrent with this season’s look – but we did promise that we’d deliver all you need to know about S/S15. So, where can you start to pick up your gorge new additions to your wardrobe? The usual suspect, Penneys (natch), Dunnes will also have a good selection of, Topshop is a good bet for flares (not to mention the back of your/your mum’s wardrobe), and Irish shopping website OPSH is a fantastic resource for pulling a whole outfit together without even leaving the house!